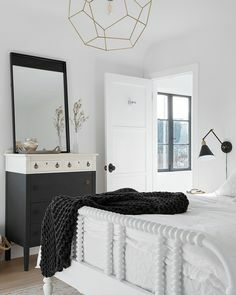 Chandeliers might be my favorite home accessory…I know I know, such a bold statement, but I think it’s kind of true…they are the perfect, elegant, classy detail to any room and they really do elevate the space. Whether it’s a crystal chandelier in over your bathtub or in your walk-in closet, or if it’s a grand beaded chandelier over your dining room table or in your kitchen…or even if it’s a huge statement chandelier in your entry way. They call attention to themselves in the best way. If I could have a chandelier in every room of my house I would…sharing some of my favorite chandeliers for you to shop and also my favorite spots to showcase a great chandelier…happy shopping! Perfect crystal chandelier for an entry way don’t you think? One of my favorites, the waterfall chandelier from West Elm…great over a dining room table or hung from a high vaulted ceiling in an entry way. You also might want to think about auction houses when looking for Chandeliers. You can find a 19th or early 20th Century ones for a steal. Christie’s had some in their spring Dec. Arts sales. Regional auction house will occasionally have one or two as well.